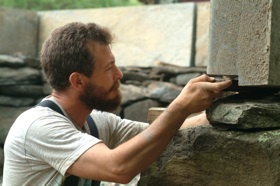 The sole proprietor of Thistle Stone Works, Michael Weitzner holds a Master Craftsman certificate issued in 2003 by the Dry Stone Walling Association of Great Britain (DSWA-GB), of which he has been a member since 1993; he is also an examiner for the DSWA-GB’s certification programme and a DSWA Certified Instructor. For several years, Michael has run training workshops in collaboration with colleagues including Dan Snow, Jared Flynn and others. He continues to provide instruction in dry stone walling both locally and in other regions. Based in Brattleboro, Vermont, since 1996, Michael Weitzner was born in Switzerland in 1962 and has lived in Spain, England, Scotland and the USA. Michael's fascination with dry stone began at an early age when he was introduced to it by his Swiss grandfather. 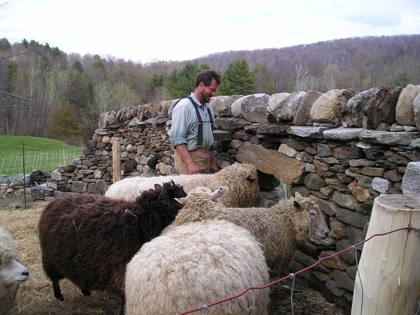 Michael has a strong insterest in historic preservation and is working to promote the use of best dry stone walling practices in public works. Recently he has written technical condition assessments of dry stone covered bridge abutments for the State of Vermont Agency of Transportation (VAOT or VTrans). Michael has also been asked to provide consultancy services for the preservation of covered bridges in Oregon and a dry stone arched bridge in New Hamphsire. His work has been featured in New Old House magazine, Vermont Life magazine, 'Good Fences' by Bill Hubbell and on HGTV's Rebecca's Garden. Michael met his wife, Michelle, in 1995 when he was a guest of esteemed colleague and friend Dan Snow of Dummerston, Vermont. They live with their daughter, Hilary Claire, and various livestock on a small hill farm in West Brattleboro. For more information about how Thistle Stone Works can help you with your stonework project, please contact us.